The 40th Jr. Iditarod has its first entrants. The Jr. event began accepting registrations on the same day registration opened for Iditarod. At the end of the day, three junior mushers had indicated their intention to compete in the 150-mile race that begins on February 25, 2017. The first Jr. Musher to turn her registration in at the picnic was Hannah Mahoney of Bloomfield Hill, MI. Hannah has dreamed of mushing since she was three years old. She got her first dog at the age of six and couple of years later acquired a sled. Earlier though, Hannah took what was available and created a makeshift sled out of a laundry basket. The harness and gang line were fashioned from ribbons and leashes. It worked better inside the house than outside. While Hannah hasn’t spent much time on sled runners up to this point, she has an aggressive training program planned with Michigan mushers and will connect with Alaska mushers for dogs, equipment and more training. Hannah is 16 years old. Veteran Katie Deits arrived with mentor Christine Roalofs to enter the junior race. Deits, a two-time veteran of the race, runs Roalofs’ City Slicker Team. Katie earned the Red Lantern for perseverance in the 2016 race. While she was the final musher to cross the Jr. finish line, she was only 1 hour and 53 minutes behind the champion. With the lack of snow in the Anchorage area, Katie had done most of her training behind a four-wheeler. It was obvious that her dogs were well trained even though sled training was only a small part of the miles. Katie attends Bartlett High School in Anchorage. She enjoys hiking and biking and plans to become a veterinary technician. Logan McCready-Debruin of Haliburton, Ontario Canada is the third early entry. Logan sent his papers to register for his first Jr. Iditarod as it’s a bit of a trip from Haliburton to Wasilla. 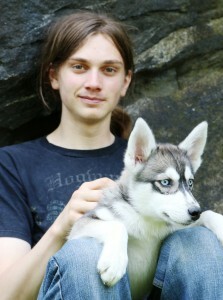 Besides mom, dad, a brother and two little sisters, Logan’s family consists of 150 Purebred Siberian Huskies and 6 cats. He’s been riding a dog sled since he was a baby and ran his first race when he was three. He’s been racing ever since. Logan set the goal to run the Jr. Iditarod when he was five. He was inspired by his father, Hank, who realized his longtime dream of completing Iditarod in 2012. The saying “like father, like son” certainly applies for Logan and Hank. Logan has helped his Dad train the Winter Dance Siberians for the Yukon Quest. Logan is a senior at Haliburton Secondary School. He plays badminton and enjoys reading, karate and sailing. The Jr. Iditarod Board of Directors is considering a format change for the 150-mile round trip race. The options the board is considering include leaving the race as it currently runs with a 10-hour required rest after the 75-mile run out to Yentna Station. A second option would be to divide the race into three 50-mile segments and require a five-hour rest between each segment. The third option would be to run three 50-mile segments but allow the mushers to decide how and when they will use their required 10 hours of rest. The rational is for the Jr. race to be more like the Iditarod with the 50-mile segments. Allowing the mushers to strategize about how they will use the required rest would make the Jr. race even more like the Iditarod. The current run of 75-miles followed by a 10-hour rest has been instrumental in encouraging and providing opportunity for t the young mushers to make new friends and connect with old friends around the much celebrated campfire at Yentna. The Board is seeking input about these formats from persons familiar with the race. The mushers signed up for the Jr. Iditarod are listed at jriditarod.com. The entry fee is waived for mushers who sign up before December 1, 2016.. Contestants in the Jr. Iditarod must fall within the ages of 14 and 17.